Anne played the flute with sweet clarity every night. The flute, the most romantic instrument, is the perfect accompaniment to any special occasion. 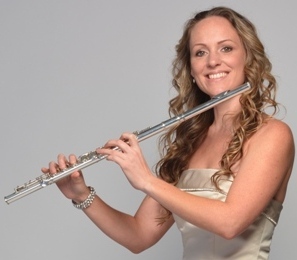 With a wide range of repertoire and a choice of groups using different instruments, Anne provides a variety of packages to suit your event or celebration. - Wissam Boustany, International Soloist. Anne Allen, an experienced and award winning professional flautist (or flutist), excels as both a soloist, ensemble and orchestral player. She has been seen and heard on TV and radio and in prestigious venues across the world, such as the Royal Albert Hall. Anne also enjoys the lighter side of music making, playing for many occasions from parties and weddings to corporate events – even openings of buildings! Clients range from small private family groups to large companies such as Pricewaterhousecoopers, from champagne receptions to a whole day of musical entertainment.